By Graig Graziosi | February 7, 2018 at 12:06a.m. The horns, called pBuzzes – essentially a bell and a slide with a removable mouthpiece made from red plastic – are a relatively new instrument, and are made specifically for young and beginner musicians. Campbell teacher Daniel Welch obtained 200 of the instruments with a $5,000 grant from the The Turning Foundation’s “Innovative Teacher Mini Grant” program. The purchase included the instruments, protective carrying cases and programming. The lightweight pBuzz – “p” stands for plastic – horns are simple to operate. The only moving part is the slide, which is broken up into colored sections for easily finding the right note and are made to teach the fundamentals of playing brass instruments. Most of the students in Welch’s class said they were interested in pursuing other instruments later on in their education. Musical competency isn’t the only lesson students learn with the pBuzz in Welch’s class. His not-so-secret motivation to introduce the program into his curriculum was to bolster his student’s literacy. 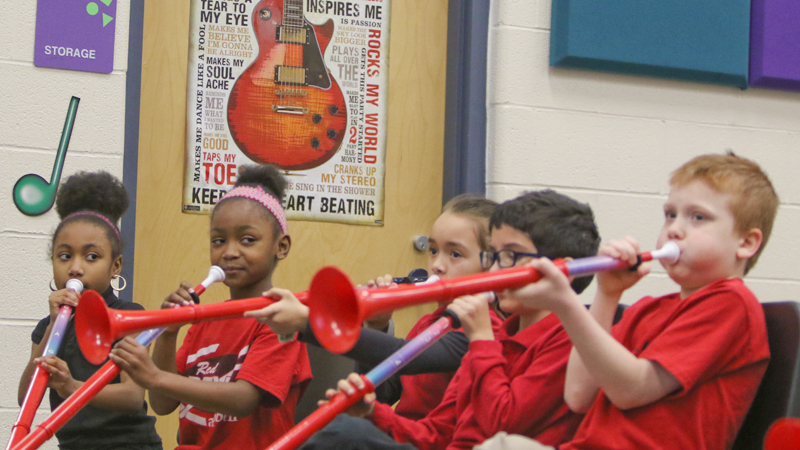 “Study after study has shown that when students learn to read music, they also see an increase in reading comprehension, which is key to understanding any subject, whether it’s math, the social sciences or anything else,” Welch said. Students are given their own instruments, and while they don’t take them home at the end of the school day, they are expected to keep track of them, protect them from damage and carry them between their main classroom and their special classes throughout the day. “In that way, it teaches them about responsibility as well,” Welch said. November 10, 2018 12:02 a.m.
May 18, 2018 12:07 a.m.